Like most good things in life, the next Pirates of the Caribbean game will be made out of Legos.Lego Pirates of the Caribbean: The Video Game will arrive in May 2011 for damn near every platform Wii, PlayStation 3, Xbox 360, DS, PSP and PC, Disney Interactive Studios and TT Games said Thursday. Disney will release the game alongside the upcoming fourth installment of the film series, Pirates of the Caribbean: On Stranger Tides. The Lego gaming avalanche is still picking up all sorts of interesting properties, and oddly enough, each one of them fit very well with each other. Sideshow Collectibles is proud to commemorate Disney&apos;s blockbuster &apos;Pirates of the Caribbean&apos; films with the Jack Sparrow Premium Format Figure. Each piece is individually painted and finished to exacting standards, dressed in a detailed, real fabric costume, each with its own unique quality and detail that is the trademark of a handcrafted Sideshow Collectibles product. Featuring an LED lantern and Jack&apos;s valued compass, The Jack Sparrow Premium Format Figure is crafted here in stunning detail, a perfect addition to any collection or Disney display. 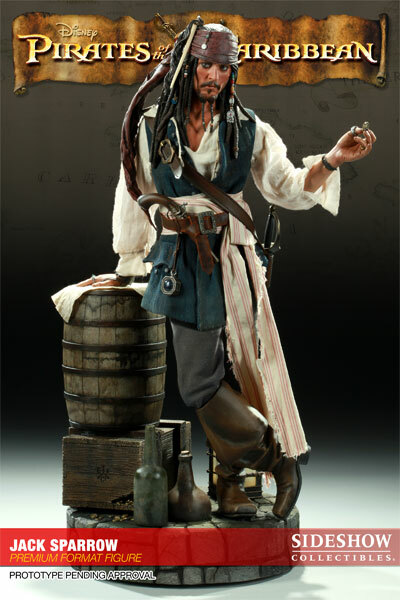 via Sideshow Collectibles, Inc. – Disney / Jack Sparrow Premium Format Figure – Sideshow Exclusive Edition. Year of Production: 2006-07 Manufacturer: Stern Production #: >3,000 BRAND NEW! Shipped in original factory packaging. One-year factory warranty. Shipping: $350.00 Driveway delivery, anywhere in the continental U.S.
All that for only $5,000!